Telerik RadListBox control enhances further your application's capabilities through its rich drag-and-drop functionality. You can easily perform various drag-and-drop operations. We will go through each of them separately. 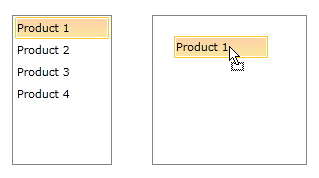 The drag and drop functionality between ListBox controls with statically declared items is not supported but the reorder functionality is supported. 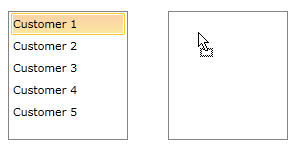 The drag-drop functionality of RadListBox can be enabled by setting its DragDropBehavior property. You should use the ListBoxDragDropBehavior class placed in Telerik.Windows.Controls.dll which is prepared to handle the drag and drop of the ListBox items. If you're using Implicit Styles note that the Style that targets RadListBoxItem should be based on the default RadListBoxItemStyle. The DragVisualProvider enriches the drag-drop functionality of RadListBox control by providing a different visual DragCue to the dragged item. EmptyDragVisualProvider - this is default DragVisualProvider. It doesn't provide any visual representation of the dragged item. 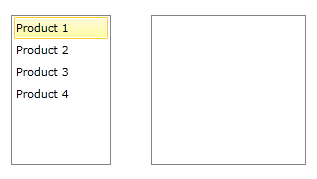 ListBoxDragVisualProvider - with the Q1 2014 release of UI for WPF ListBoxDragVisualProvider has been improved in order to provide additional information. Now its DragCue also indicates the drop position of the dragged item - whether it would be before or after the item below. 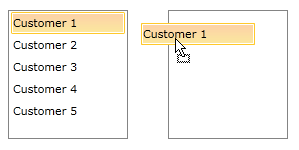 The ListBoxDragVisualProvider DragCue can be modified in order to have the old appearance. You can find a runnable project which demonstrates the exact approach to achieve that in our online SDK repository here, the example is listed as ListBox / ModifyListBoxDragVisualStyle. ScreenshotDragVisualProvider - provides the exact visual representation of the dragged item. DefaultDragVisualProvider - provides the string representation of the dragged item. Custom DragVisualProvider - more detailed information on how to create a custom DragVisualProvider can be found here. In scenarios with drag-drop between controls containing different item types the dragged data should be converted using a DataConverter. 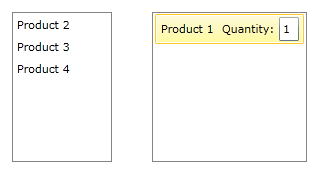 The following example shows how to create a custom DataConverter when converting data between two RadListBox controls, one of them containing items of type Product and the other - of type Order.